The forum, moderated by local elected officials, Senator Scott Bennett, Danville Mayor, Scott Eisenhauer and County Board Chairman Mike Marron began with an update on the site, calling on Governor, the Illinois EPA, and the Illinois DNR to work together to move 3.3 million cubic yards of toxic coal ash out of the floodplain. Company representatives have previously indicated their preference for simply capping the waste material and leaving it in its present location. 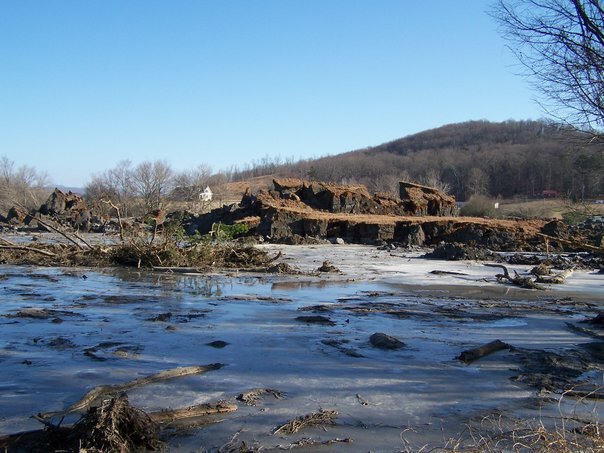 Opponents object to this approach, pointing out that groundwater could continue to flow through the ash, carrying with it harmful coal ash chemicals. Rick Cobb, Deputy Division Manager, Division of Public Water Supplies of the Illinois EPA explained Dynegy-Vistra, the Texas based company that currently owns the three waste pits, is expected to submit its final groundwater report to IEPA in late October. An IEPA decision will follow. Other speakers at the hearing included Dr. 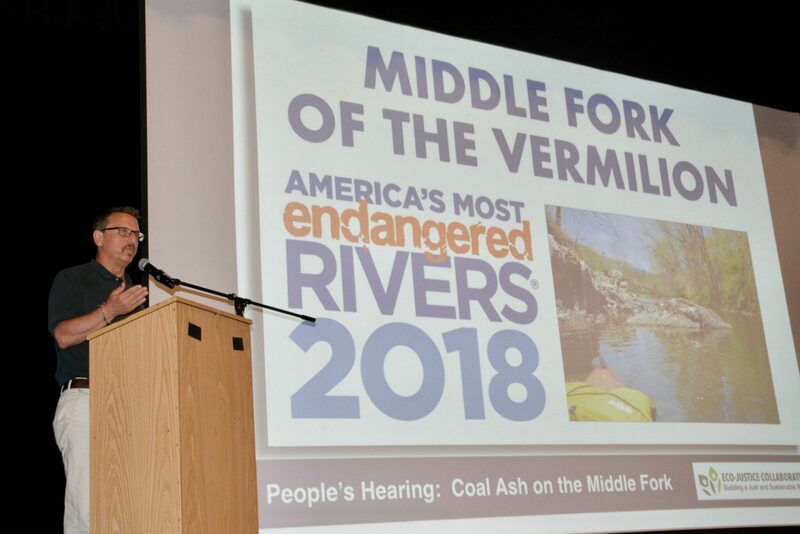 Rob Kanter, Clinical Associate Professor at UIUC and outdoor writer who spoke of the ecological and recreational values of the river, Illinois’ only National Scenic River and recently recognized as one of America’s most endangered rivers due to the coal ash threat. “The Middle Fork is an area treasure, valued by tens of thousands of people for its natural beauty, biological diversity, and water-based recreation”, said Kanter. 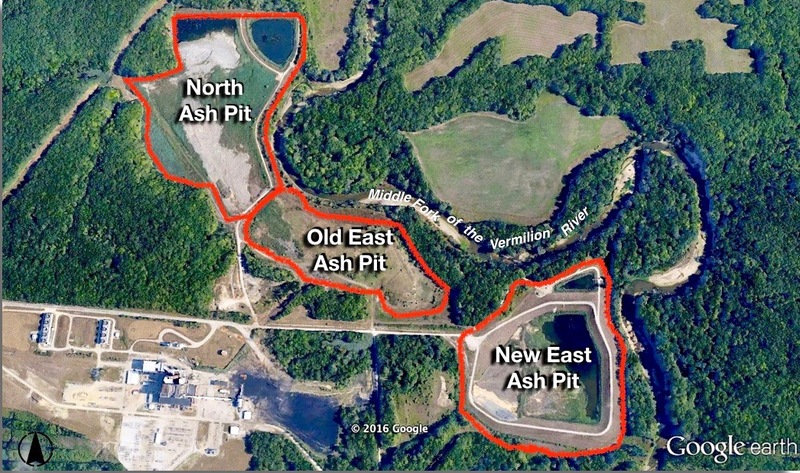 “All of this could be destroyed in a matter of minutes by a coal ash catastrophe”. The informational portion of the meeting ended with a powerful story from Sarah McCoin, resident of rural Harriman, Tennessee. Speaking from her home near the site of the coal ash disaster at the TVA power plant on the Emory River, McCoin recalled the devastation of the coal ash spill on December 22, 2008, when an embankment breached on a Duke Energy facility releasing 5.4 million cubic yards of coal ash, covering fields, damaging homes and filling waterways. In the end the spill engulfed 300 acres and cost well over $1.2 billion in cleanup. “It was like a really bad movie” McCoin said. Addressing the problem with coal ash storage, McCoin said, “What’s really almost hard to believe it has been nearly ten years and we have the same stories going on across the nation”. “My story is unique, but sadly it won’t be the last story with these consequences”. The final hour of the hearing offered local residents an opportunity to share their concerns and voice their comments. Representatives of Eco-Justice Collaborative noted that the evening’s proceedings were recorded and will be delivered to Governor Bruce Rauner and IEPA Director Alec Messina. Those persons wishing to make additional comments on the proposal can do so by going to www.ecojusticecollaborative.org. Just fill in the comment form and send. Talking points are posted for you to use, if needed. Click here for more information on the People's Hearing.